Over the past week or two I’ve been busy pulling things out of dusty corners of closets and off of the far back edges of shelves so that I can see what I’ve got, reorganize it and put it all back neatly and hopefully in a more logical way. I save boxes and put some to work in my latest round of organizing. This box started its life holding canning jars with one of those cardboard honeycomb divider kind of things inside to keep the jars separate. 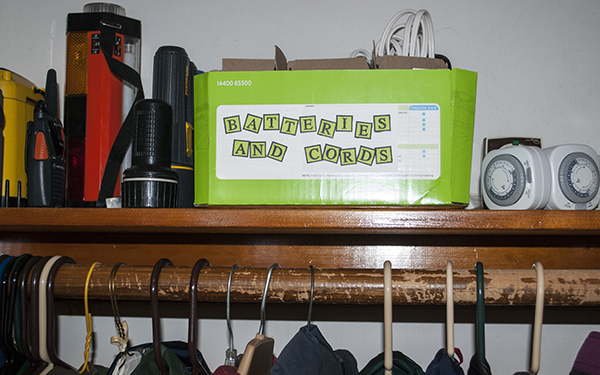 Here I am re-using it to store extra batteries, sorting the various battery sizes inside the nine sections inside the box, with a few extension cords tucked in as well. But if you put a box like this on a shelf above eye-level, will you remember what is in it? Maybe, but will your husband or kids know what you’ve tucked in that box? Probably not, even if you’ve told them! So you need a label. I think of stamps as tools. They don’t have to be ONLY used to make greeting cards. So I stamped out the label using alphabet stamps. This particular label needed to be big, so I used an 8 1/2″ x 11″ piece of white label from the office supply store, stamped the letters in black ink (Stewart Superior’s India Ink Black to be specific), gave it a minute to dry and then colored in the letters with a green alcohol ink marker (Copic). Then I cut the label to size and slapped it on the box. Depending on the size of your alphabet letters and the length of your text, you might be able to use smaller sized labels. Ok, now I’m going back to stamping some more labels for more boxes around the house . . ..
Great Idea for being sure to find what you are looking for on the shelves above your head!!! Good job Nancie! I always seem to think “computer” first when I need a label, so this is a GREAT idea. Thanks.